We are proud to offer New Era as one of our carriers. If you are looking for free quotes contact us at (800) 208-4974. Discover why you should work with us here. New Era maintains an A.M. Best rating of B+ which shows they are a financially stable company. The difference between an A-rated carrier and B+ should NOT be a major factor is the deciding what carrier to go with and I explain why here. What Plans Does New Era Offer? 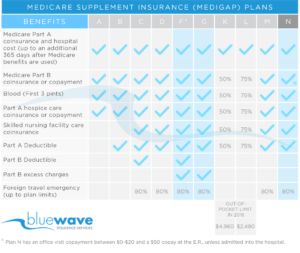 New Era offers all the popular Medigap plans; F, G and N. If you have read any of my other blog posts then you know I always recommend Plan G over F.
Plan N is also a good option if you are not going to the doctor very often and want to enjoy a lower monthly premium. 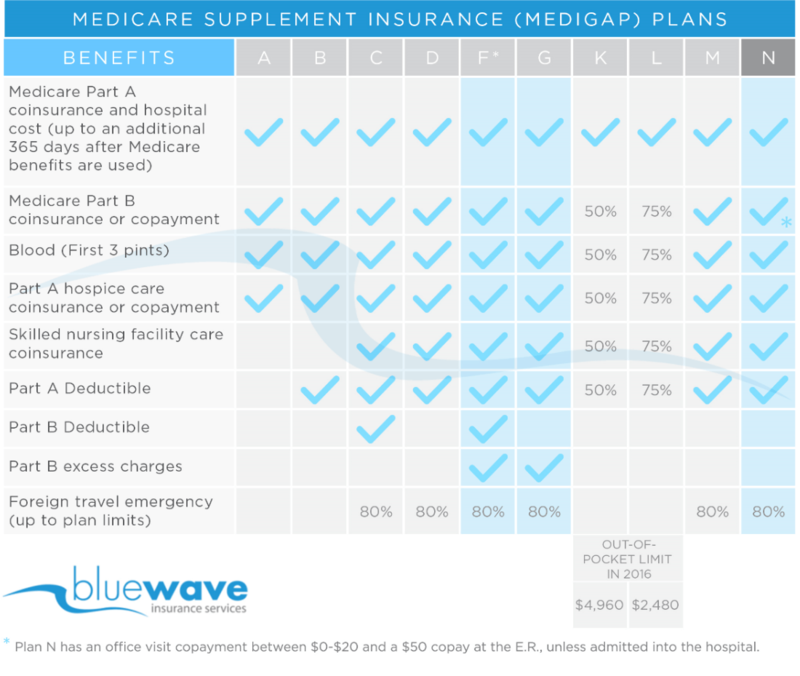 See the chart below of the standardized Medigap plans. Plan F is the most comprehensive Medicare Supplement plans available. As you can see in the chart above, F covers all costs that are not picked up in full by Orignal Medicare. This plan comes with a higher premium than Plans G and N.
Overall we recommend Plan G vs F. Plan G provides the most value and long-term rate stability. New Era is competitive for Plan F in most states across the country. Plan G is often referred to as the “Value” plan or “Gold” plan. This plan provides the most value for your premium dollar. The only benefit difference between F and G is an annual deductible of $185 in 2019. Other than that, the plans are identical. The premium difference, however, covers that benefit difference. In addition, Plan G has historically had lower rate increases than Plan F.
Plan N is a great option for those folks who want to save money on premium and don’t see the doctor very often. With Plan N, you will have an office visit copay up to $20 for each visit. In addition, you will pay the Part B deductible and Part B excess charges are not covered. For more information on Plan N see our full description. New Era Life maintains some of the most competitive rates in many areas across the country. Depending on where you live, New Era / Philadelphia American could be the best choice for your Medicare supplement insurance. One thing that we love about New Era, is the great rate increase history they have. Their rate increases are always in the single digits, even on their plan F.
Most companies, will at one time or another have a double-digit rate increase on their plan F. New Era has a great handle on their rates and is one of the best in the business for rate stability. We love working with them knowing our clients will not face big rate increases in the future. As you can see New Era is much less for the same exact Plan F. In addition, they have liberal health underwriting. If you have been denied by other carriers there is a good chance you can get approved with New Era. Note: health questions do NOT apply if you are turning 65 or new to Part B. Call us at (800) 208-4974 and I can help you find out if you are eligible for a lower rate on your Medigap plan. Overall we love recommending New Era Life / Philadelphia American to our clients for their Medigap insurance. We know that our clients will enjoy stable rate increases and will never have to worry about overpaying for their coverage. When our clients are happy we are happy. If you are interested in getting a quote please call us at (800) 208-4974 or click below to submit your online quote request. To learn more about other options, take a look at our carrier reviews. Overall New Era / Philadelphia American is a strong recommendation. Contact us at (800) 208-4974 for a free quote.